In British English, “geyser” can also refer to the water heating system. The formation of geysers requires a favorable hydrogeology, which exists in only a few places on Earth, and so they are fairly rare phenomena. About 1,000 exist worldwide, with about half of these in Yellowstone National Park, U.S.. Geyser eruptive activity may change or cease due to ongoing mineral deposition within the geyser plumbing, exchange of functions with nearby hot springs, earthquake influences, and human intervention. Erupting fountains of liquefied nitrogen have been observed on Neptune's moon Triton, as have possible signs of carbon dioxide eruptions from Mars' south polar ice cap. These phenomena are also often referred to as geysers. Instead of being driven by geothermal energy, they seem to rely on solar heating aided by a kind of solid-state greenhouse effect. On Triton, the nitrogen may erupt to heights of 8 km (4.8 miles). Geyser activity, like all hot spring activity, is caused by surface water gradually seeping down through the ground until it meets rock heated by magma. The geothermally heated water then rises back toward the surface by convection through porous and fractured rock. 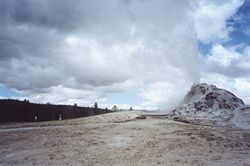 Geysers differ from noneruptive hot springs in their subterranean structure; many consist of a small vent at the surface connected to one or more narrow tubes that lead to underground reservoirs of water. As the geyser fills, the water at the top of the column cools off, but because of the narrowness of the channel, convective cooling of the water in the reservoir is impossible. The cooler water above presses down on the hotter water beneath, not unlike the lid of a pressure cooker, allowing the water in the reservoir to become superheated, i.e. to remain liquid at temperatures well above the boiling point. Ultimately, the temperatures near the bottom of the geyser rise to a point where boiling begins; steam bubbles rise to the top of the column. As they burst through the geyser's vent, some water overflows or splashes out, reducing the weight of the column and thus the pressure on the water underneath. With this release of pressure, the superheated water flashes into steam, boiling violently throughout the column. The resulting froth of expanding steam and hot water then sprays out of the geyser. Eventually the water remaining in the geyser cools back to below the boiling point and the eruption ends; heated groundwater begins seeping back into the reservoir, and the whole cycle begins again. The duration of eruptions and time between successive eruptions vary greatly from geyser to geyser; Strokkur in Iceland erupts for a few seconds every few minutes, while Grand Geyser in the U.S. erupts for up to 10 minutes every 8–12 hours. There are two types of geysers: fountain geysers erupt from pools of water, typically in a series of intense, even violent, bursts; and cone geysers which erupt from cones or mounds of siliceous sinter (also known as geyserite), usually in steady jets that last anywhere from a few seconds to several minutes. Old Faithful, perhaps the best-known geyser at Yellowstone National Park, is an example of a cone geyser. The intense transient forces inside erupting geysers are the main reason for their rarity. There are many volcanic areas in the world that have hot springs, mud pots and fumaroles, but very few with geysers. This is because in most places, even where other necessary conditions for geyser activity exist, the rock structure is loose, and eruptions will erode the channels and rapidly destroy any nascent geysers. Most geysers form in places where there is volcanic rhyolite rock which dissolves in hot water and forms mineral deposits called siliceous sinter, or geyserite, along the inside of the plumbing systems. Over time these deposits cement the rock together tightly, strengthening the channel walls and enabling the geyser to persist. Geysers are fragile phenomena and if conditions change, they can ‘die’. Many geysers have been destroyed by people throwing litter and debris into them; others have ceased to erupt due to dewatering by geothermal power plants. The Great Geysir of Iceland has had periods of activity and dormancy. During its long dormant periods, eruptions were sometimes humanly-induced—often on special occasions—by the addition of surfactants to the water. Inducing eruptions at Geysir is no longer done, as the forced eruptions were damaging the geyser's special plumbing system. Following an earthquake in Iceland in 2000 the geyser became somewhat more active again. Initially the geyser erupted about eight times a day. 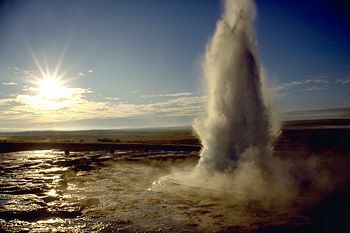 As of July 2003, Geysir erupts several times a week. The specific colors of geysers derive from the fact that despite the apparently harsh conditions, life is often found in them (and also in other hot habitats) in the form of thermophilic prokaryotes. No known eukaryote can survive over 60 °C (140 °F). 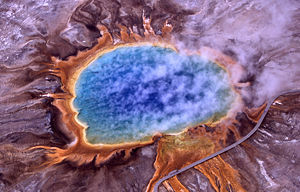 In the 1960s, when the research of biology of geysers first appeared, scientists were generally convinced that no life can survive above around 73 °C (163 °F)—the upper limit for the survival of cyanobacteria, as the structure of key cellular proteins and deoxyribonucleic acid (DNA) would be destroyed. The optimal temperature for thermophilic bacteria was placed even lower, around 55 °C (131 °F). However, the observations proved that it actually is possible for life to exist at high temperatures and that some bacteria prefer even temperatures higher than the boiling point of water. Dozens of such bacteria are known nowadays. Thermophiles prefer temperatures from 50 to 70 °C whilst hyperthermophiles grow better at temperatures as high as 80 to 110 °C. As they have heat-stable enzymes that retain their activity even at high temperatures, they have been used as a source of thermostable tools, that are important in medicine and biotechnology, for example in manufacturing antibiotics, plastics, detergents (by the use of heat-stable enzymes lipases, pullulanases and proteases), and fermentation products (for example ethanol is produced). The fact that such bacteria exist also stretches our imagination about life on other celestial bodies, both inside and outside the solar system. Among the hypothermophiles, the first discovered and the most important for biotechnology is Thermus aquaticus. Dolina Geiserov, Kamchatka Peninsula, Russia, Asia - partially destroyed by a mudslide on June 3, 2007. There used to be two large geysers fields in Nevada—Beowawe and Steamboat Springs—but they were destroyed by the installation of nearby geothermal power plants. At the plants, geothermal drilling reduced the available heat and lowered the local water table to the point that geyser activity could no longer be sustained. There are more individual geysers around the world, in California, Peru, Bolivia, Mexico, Dominica, Azores, Kenya, Slovakia and Japan, but no other large clusters. Yellowstone is the largest geyser locale, containing thousands of hot springs, and between three and five hundred geysers. Yellowstone includes the tallest active geyser (Steamboat Geyser in Norris Geyser Basin) and the renowned Old Faithful Geyser in Upper Geyser Basin. Many of New Zealand’s geysers have been destroyed by humans in the last century. Several New Zealand geysers have also become dormant or extinct by natural means. The main remaining field is Whakarewarewa at Rotorua. Two thirds of the geysers at Orakei Korako were flooded by the Ohakuri hydroelectric dam in 1961. The Wairakei field was lost to a geothermal power plant in 1958. The Taupo Spa field was lost when the Waikato River level was deliberately altered in the 1950s. The Rotomahana field was destroyed by the Mount Tarawera eruption in 1886. The Waimangu Geyser which existed from 1900 to 1904 was the largest geyser ever known. It ceased to erupt after a landslide covered its crater. Small numbers of geysers still exist at other places within the Taupo Volcanic Zone including Ketetahi, Tokaanu and Wai-O-Tapu. In a number of places where there is geothermal activity wells have been drilled and fitted with impermeable casements that allow them to erupt like geysers. Though these so-called artificial geysers, technically known as erupting geothermal wells, are not true geysers, they can be quite spectacular. Little Old Faithful Geyser, in Calistoga, California, is probably an erupting geothermal well. Sometimes drilled cold-water wells erupt in a geyser-like manner due to the build-up of pressure from dissolved carbon dioxide in the water. These are not true geysers either, but are often called cold-water geysers. The best known of these is probably Crystal Geyser, near Green River, Utah. A perpetual spouter is a natural hot spring that spouts water constantly. Some of these are incorrectly called geysers, but because they are not periodic in nature they are not considered true geysers. Dark streaks deposited by geysers on Triton. One of the great surprises of the Voyager 2 flyby of Neptune in 1989 was the discovery of geysers on its moon, Triton. Astronomers noticed dark plumes rising to some 8 km (4.8 miles) above the surface, and depositing material up to 150 km (90 Miles) downstream. All the geysers observed were located between 40° and 60°S, the part of Triton's surface close to the subsolar point. This indicates that solar heating, although very weak at Triton's great distance from the Sun, probably plays a crucial role. It is thought that the surface of Triton probably consists of a semi-transparent layer of frozen nitrogen, which creates a kind of greenhouse effect, heating the frozen material beneath it until it breaks the surface in an eruption. A temperature increase of just 4 K above the ambient surface temperature of 38 K could drive eruptions to the heights observed. Geothermal energy may also be important. Unusually for a major satellite, Triton orbits Neptune in a retrograde orbit—that is, in the opposite direction to Neptune's rotation. This generates tidal forces which are causing Triton's orbit to decay, so that in several billion years time it will reach its Roche limit  with Neptune. The tidal forces may also generate heat inside Triton, in the same way as Jupiter's gravity generates tidal forces on Io which drive its extreme volcanic activity. Each eruption of a Triton geyser may last up to a year. Voyager's images of Triton's southern hemisphere show many streaks of dark material laid down by geyser activity. ↑ J. A. Glennon, 2007 About Geysers. (University of California, Santa Barbara. Originally posted January 1995, updated June 4, 2007.) Retrieved September 26, 2007. ↑ T. S. Bryan, 1995 The geysers of Yellowstone. (Niwot, CO: University Press of Colorado). ↑ J. A. Glennon, 2005. "Carbon Dioxide-Driven, Cold Water Geysers." (University of California, Santa Barbara. Originally posted February 12, 2004, last update May 6, 2005.) Retrieved September 26, 2007.; Glennon and Pfaff 2005. Glennon, J. A. and R. M. Pfaff. 2003. "The extraordinary thermal activity of El Tatio Geyser Field, Antofagasta Region, Chile." Geyser Observation and Study Association (GOSA) Transactions 8: 31-78. Glennon, J. A. 2005. Carbon Dioxide-Driven, Cold Water Geysers. University of California, Santa Barbara. Originally posted February 12, 2004, last update May 6, 2005. Retrieved September 26, 2007. Glennon, J. A. 2007. About Geysers. University of California, Santa Barbara. Originally posted January 1995, updated June 4, 2007. Retrieved September 26, 2007. Glennon, J. A., R. M. Pfaff. 2005. The operation and geography of carbon-dioxide-driven, cold-water geysers. GOSA Transactions 9: 184-192. Kelly W. D. and C. L. Wood. 1993. "Tidal interaction: A possible explanation for geysers and other fluid phenomena in the Neptune-Triton system." Lunar and Planetary Inst., Twenty-Fourth Lunar and Planetary Science Conference. Part 2, 789-790. Soderblom L. A., T. L. Becker, S. W. Kieffer, R. H. Brown, C. J. Hansen, T. V. Johnson. 1990. "Triton's geyser-like plumes - Discovery and basic characterization." Science 250: 410-415. Geysers and How They Work. Yellowstone National Park. Geyser Observation and Study Association (GOSA). Geysers of Yellowstone: Online Videos and Descriptions. Streepey, Meg. Geysers and the Earth's Plumbing Systems. This page was last modified on 21 June 2017, at 16:27.